Archaeobotanists give us vital information about the plant remains on our site. From them we can learn about the crops people were growing and the food they were eating and more about the natural ecology of the site. How does it work? When we come across certain types of layers, such as a floor, a dump, a pit, or a floor bedding, we collect a bucket of dirt and send it in to the archaeobotanists. They then use a flotation machine to separate the heavy fraction (usually small stones, pebbles, shell and other debris) from the light fraction (botanical remains including seeds and pits). 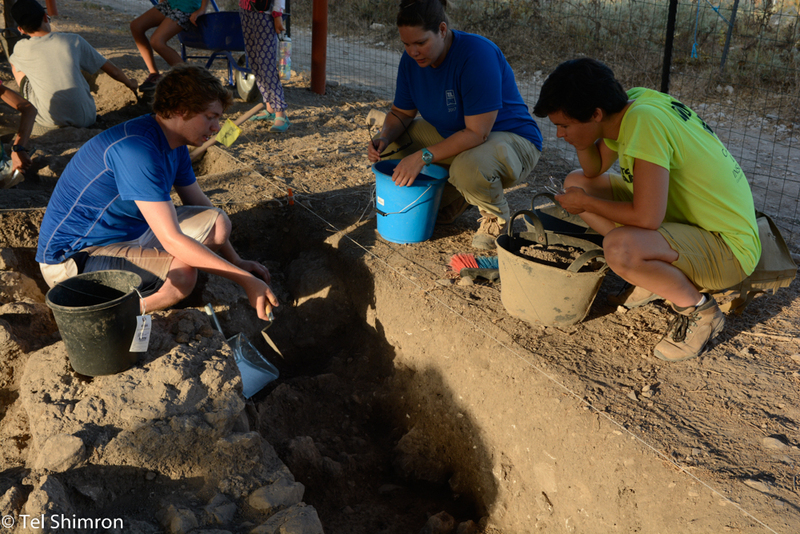 Once they've done that, they sort and identify the material and in so doing, give us another clue about the history of Tel Shimron. In the pictures above, the archaeobotanists visit Grid 23/24 and discuss a flotation sample with the volunteer who collected it. Below, Adam, the Grid Supervisor of Grid 92, discusses stratigraphy and baulks with the co-directors.